New Worthing United boss Curtis Foster. Picture by Ellie Sanderson. Worthing United have announced the appointment of Curtis Foster as the new first team manager at Lyons Way. Foster joins the Mavericks following spells with Worthing and Southwick. He will be joined by Matt Brace as his assistant. Worthing United chairman Bill Clifford and the new Mavericks man in charge Curtis Foster. Picture by Ellie Sanderson. The new manager's first game in charge for United will be their home clash against Billingshurst in Division 1 on Saturday. 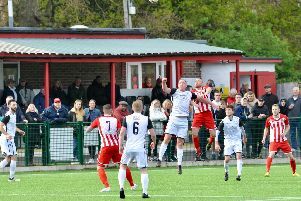 Clifford had been in temporary charge since September 23, after long-serving ex-boss Matt Evans was relieved of his duties after an 8-1 loss to Bexhill United. Despite the Mavericks not making a permanent appointment for over a month, Clifford felt the club were right to bide their time as they looked for the 'right fit'. The chairman added: "We were never in any hurry. We were fortunate in the fact that I was around and with my managerial experience I was able to hold down the fort. "It was never a rush, thinking crikey we've got to get someone in otherwise we are snookered. We were quite fortunate that we were able to take our time. "We must have had a dozen applications in our desk and each one we looked at carefully. Some we spoke to, some we didn't but were able to find the fit we were looking for in terms of looking ahead. "It was Curtis that eventually came along and we looked at each other and thought, yes this is our man. You can't land it on one thing and say he got the job because the other candidates didn't have it. I just feel he provided the right fit." Clifford also revealed that Foster has already taken a training session and that he had been impressed by what he had seen so far. He continued: "Curtis came to watch the team on Saturday (away to Storrington) and he was introduced to the players last night (Tuesday) in training. "He took training and we had a record turn out, which was good, and he impressed everybody at training which is certainly a good start because first impressions are important." Clifford is formerly the manager of Montpelier Villa, Hurstpierpoint, Portslade Athletic and United’s under-21s but at no point did the Mavericks chairman have the desire to take the manager's job on a permanent basis. He said: "I made a conscious decision in the summer to step away from management. I've been doing it for 25 years and I made the decision to change my hobby, that being managing football teams, to managing a football club. "Whilst I always knew it was a back up that I could always cover in any eventuality, it was never something I wanted to go back into full time."